FILE - Seleka fighters sit on a truck in Goya, Central African Republic, June 11, 2014. Fighters from Central African Republic's largely Muslim Seleka militia attacked refugees in the country's remote north on Wednesday, stabbing or hacking to death 13 people before U.N. peacekeepers repelled them, killing at least 10, officials said. Several people were also wounded in the attack targeting the Kaga Bandoro, a town of dirt roads and thatched mud huts. A Reuters witness saw militiamen stab two refugees to death as people were fleeing. When some tried to fight back with clubs, the militiamen began firing their guns. Hundreds of panicked villagers, already refugees from earlier violence, then fled in the direction of the U.N. base. Central African Republic has been in chaos since early 2013 when the Seleka, which draws mostly from the country's minority Muslim population, toppled then-President Francois Bozize. FILE - Seleka fighters patrol the town of Lioto, Central African Republic, June 6, 2014. Militias representing the interests of the Christian majority responded by attacking Muslims and a fifth of the population fled their homes to escape the violence, leaving the isolated nation deeply divided along ethnic and religious lines. "We were in the house when suddenly the Seleka arrived and set it on fire," said a witness, Marcelline Kanga, 40. "They killed my uncle and stabbed my brother to death right there." Yongon Samson, 48, described seeing a body with the head sliced off it as he ran for cover. Thousands of people displaced from the latest flare-up of violence gathered around the U.N. peacekeeping base. A Catholic priest took refuge inside. Troops from the mission, called MINUSCA, opened fire to dispel the militias, a Reuters witness said. A U.N. official, who declined to be identified, said the peacekeepers had to open fire in order to protect the civilian population. 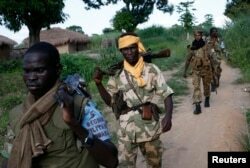 The official confirmed that at least 10 Seleka were killed. The country, which holds reserves of uranium, gold and diamonds, is one of the world's most isolated economies, with exports and imports having to travel around 850 miles by road between the capital Bangui to the Cameroonian port of Douala. France said on Friday it was keeping an eye on the worsening security situation in Central African Republic, but that it would still withdraw most of its troops by the end of the month. Eleven people were killed in clashes in the capital Bangui last week, set off by the murder of an army officer. Pope Francis visited the capital at the end of last year to implore Christians and Muslims to end a spiral of hate.